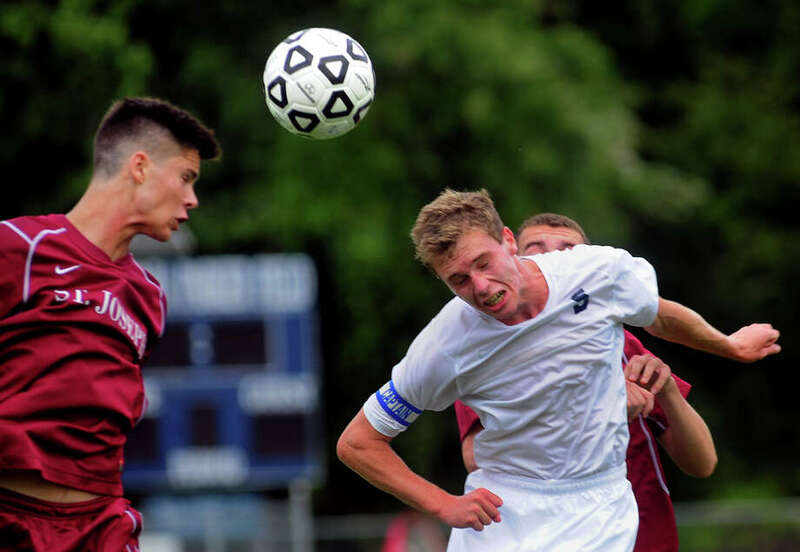 Staples captain Patrick Beusse, right, heads the ball with St. Joseph's Christian Barroso looking to intercept, during boys high school soccer action in Westport, Conn. on Tuesday September 9, 2014. For all of the chances the Staples boys soccer team managed to create against St. Joseph in the season-opener on Tuesday, the Wreckers needed a little help from the woodwork to secure the three points and ensure a positive start to the campaign. Michael Reid had a goal and assist for Staples, which kicked off the season with a 2-0 win over the Cadets at Loeffler Field. The win was the seventh straight over St. Joseph. "Definitely a huge win," Reid said. "It's nice to go into the season with a 2-0 victory; definitely set the tone well. We can only go up from here." Both goals involved a little of help from the cage, but it was more than the Wreckers deserved after outshooting the Cadets 20-12 and controlling the majority of play with Reid pulling the strings. "Michael was really solid," Wreckers coach Dan Woog said. "He ran the show, he distributed and he won tackles. ... I'm not surprised; I don't think the rest of the league knows him but they will pretty soon." The Wreckers dominated the first half and would have wrapped up the game early if not for a number of saves by Cadets goalie Joseph Lucy. Staples sent the tone early as Lucy was forced to make a double save from close range 1:15 into the game. "For our first outing, really nice team stuff," Woog said. "We worked the ball around, we possessed and we involved everybody; the sort of stuff we really want to do." Staples continued to pile on the pressure with balls into the box and was finally rewarded with 21:48 left in the first half. Reid won the ball in midfield, turned his defender and lofted a ball into the heart of the St. Joseph defense that drew out Lucy. Patrick Beusse beat him to the ball and hit a low show that trickled into the net off the post. "Our shape was not what we worked on in the preseason, and you can't expect to hang in a game with a team like (Staples) when half of your players perform and half doesn't," St. Joseph coach Steven Waizenegger said. The Wreckers doubled their advantage early in the second half. Gabe Pensak smashed an effort off the crossbar, and the rebound headed into Reid's direction. Without much time to react, Reid smashed the ball into the net. "If I'm being honest, not much (thought)," Reid said. "It was a pretty fluky goal; it was a great shot from Gabe. A nice and easy setup for me to put it in the back of the net." St. Joseph finally came into the match with about 25 minutes left and created a number of chances in quick succession that worked Wreckers goalie Noah Schwaeber (six saves). Pacey forward Matthew Reis generated a number of chances when given the opportunity, but Schwaeber was up to the task. "I put (Reis) up with anyone," Waizenegger said. "He's a good footballer; he is going to give teams trouble but we have to play to our strengths we got to get him the ball and get support." Records: St. Joseph 0-1; Staples 1-0. Goals: Staples--Michael Reid, Patrick Beusse. Assists: Reid. Goalies: St. Joseph--Joseph Lucy (10 saves) Staples--Noah Schwaeber (6 saves). Shots: St. Joseph--12; Staples--20.